According to cosmologists, two utterly mysterious forms of matter and energy—called dark matter and dark energy—make up most of the universe. Ordinary matter (stars, planets, and everything else made of atoms) accounts for a measly five percent or so of the cosmic budget. Physicist Tesla Jeltema is investigating the mysteries of dark matter and dark energy by studying clusters of galaxies, the largest assemblies of matter in the universe. An associate professor of physics at UC Santa Cruz, Jeltema is deeply involved in the Dark Energy Survey (DES), a large international collaboration to measure the effects of dark matter and dark energy on the expansion of the universe and the growth of large-scale structures like galaxy clusters over time. She co-chairs the galaxy clusters working group and leads one of the cluster analysis teams for DES, among other responsibilities. Astronomers are able to look back in time by observing distant galaxies, because it takes billions of years for the light from those galaxies to reach telescopes on Earth, Jeltema explained. "Going back in time and looking at how structures change over time gives us a handle on how the universe has evolved," she said. Scientists looking back in time at distant supernovae discovered dark energy in 1998. Their results showed that the universe is not just expanding, as Edwin Hubble had shown in the 1920s, but that the expansion of the universe is speeding up. This discovery meant that either Einstein's theory of gravity needs revision or there is some unknown form of energy in the universe—now called dark energy—that somehow gives rise to "negative gravity" or gravitational repulsion. Dark matter, on the other hand, revealed itself through the gravitational attraction it exerts on the stars in galaxies. Gravity seems to be the only way dark matter, which is invisible, interacts with ordinary matter. Because there is so much more dark matter than ordinary matter, it has played a dominant role in pulling matter together to form galaxies and other structures. "Dark energy affects the expansion of the universe, while dark matter affects how quickly things are pulled together by gravity," Jeltema said. Exactly how this cosmological "tug-of-war" between dark matter and dark energy has played out over time is not yet clear, but matter seems to have dominated for much of cosmic history, slowing expansion and driving the formation of galaxies and large-scale structures. Several billion years ago, however, as matter became increasingly diluted by the expansion of the universe, dark energy took over and began to accelerate the rate of expansion. The Dark Energy Survey is examining this cosmic acceleration with unprecedented accuracy and precision. 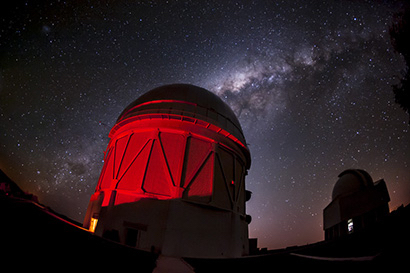 The survey is using a powerful new instrument called the Dark Energy Camera, which is mounted on the 4-meter Blanco Telescope at the Cerro Telolo Inter-American Observatory in Chile. Covering about an eighth of the sky in the southern hemisphere, the survey is gathering data from more than 300 million galaxies and thousands of supernovae. While Jeltema's group focuses on galaxy clusters, DES is also using several other observational strategies or "probes" to measure the effects of dark energy. The survey, which began in 2013, involves over 400 scientists from 25 institutions in 7 countries. UCSC astronomer Ryan Foley is part of a group using supernova observations to study the expansion history of the universe. Galaxy clusters can tell researchers about the formation of large-scale structure and the amount of matter in the universe. By comparing the number and sizes of galaxy clusters in the nearby universe with those farther away, researchers can tell how fast they formed and how their formation changed over time. "The rate of formation tells you about the density of dark energy, and it tells you how much mass is there as well," Jeltema said. "If you look back in time, you will see fewer clusters of galaxies early on and, as you go forward, more and larger clusters as things continue to grow. When dark energy dominates, however, the expansion rate speeds up and the growth of structure slows down because things are getting farther apart." One of the key questions researchers hope to answer is whether dark energy is a constant, or if its density has changed over time. In August, the collaboration published its initial results in a series of papers. The findings included the most accurate measurement ever made of the large-scale structure of the universe, revealing the amount and “clumpiness” of dark matter. 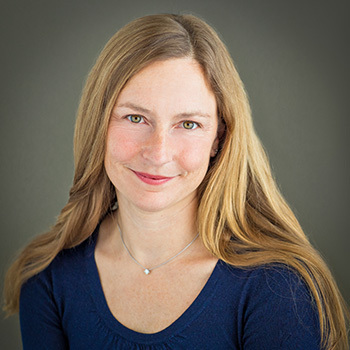 Although Jeltema was a coauthor of those papers, along with many others, she said the main results of her work on galaxy clusters have not yet been published. She expects several papers on galaxy clusters to be available in the next few months. The Dark Energy Survey will complete its observations in 2018, giving scientists a vast bounty of observational data and measurements to study for years to come. Meanwhile, planning for the next major survey to probe the nature of dark matter and dark energy has already begun. Jeltema and several other UCSC physicists and astronomers are involved in planning and design work for the Large Synoptic Survey Telescope (LSST), currently under construction in Chile. The LSST’s ten-year survey is expected to begin in 2022.